One of the biggest surprises from this summer's Solo: A Star Wars Story was the inclusion of Darth Maul (or just Maul, minus the Darth, for those who have kept up with The Clone Wars and Rebels) in a brief but memorable cameo. Unfortunately, the character didn't actually appear in the flesh. Instead, Maul was included via a hologram, meaning we didn't get to see the former Sith in all of his glory. Now, ahead of the Solo home video release, Lucasfilm has released some images of Maul, robot legs and all. Obi-Wan Kenobi cut Darth Maul in half at the end of The Phantom Menace, taking the beloved villain out far too soon. Fortunately, he was brought back in The Clone Wars animated series and was resurrected via some fancy robot legs, which can be seen in these new photos for the first time in live-action, which is pretty awesome. It's just a shame we didn't get to see more of it in Solo. Ray Park returned to play the character again and, in a recent interview, he explained how it all went down behind the scenes. Here's what he had to say about it. "I found out last June/July when we were in Guatemala. I got the phone call from Lynne Hale from Lucasfilm. And it was really nice of her, because she said to me 'Ray, we're just calling to see if you would like to do it.' And I went [inhales slowly] 'Yeah. Do you want me on the plane now?'" Similar to how it was handled in The Phantom Menace, Ray Park played the character on screen, while someone else provided the voice. Originally, it was Peter Serafinowicz. In Solo, Lucasfilm utilized Sam Witwer, who has voiced the character in the animated shows as of late and has made Darth Maul his own. Even though Maul's inclusion in Solo took many by surprise, Park actually did a poor job of keeping it a secret. Several of his Instagram posts heavily hinted at a return to the role. One such post included a photo of him with a recently shaved head and a not-so-subtle caption. "Now... I wonder why i shaved my hair a wee while ago? #sith #sithlife #secrets #baldy #cleanshaved #starwars #solo #maul #surprise #london #besttime #thankyou"
Since so many fans were hoping that Maul would factor into the rumored Obi-Wan movie, they probably didn't put much thought into the idea that Ron Howard could include him in the Han Solo movie. This has, no doubt, fueled further desire to see more of Maul on the big screen. 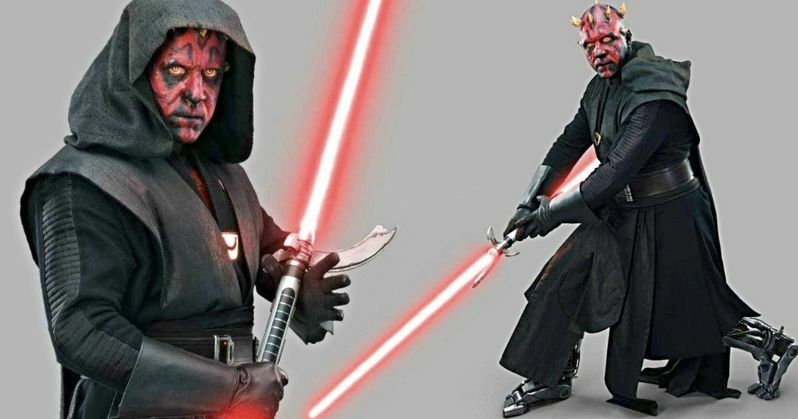 If Lucasfilm comes calling, Ray Park has ideas on what he'd like to do with him down the line. "If anything ever happens in the future and the character is back, and it's me? I have a lot of great ideas of what I'd like to do with it." Solo ultimately was something of a misfire, grossing $392 million worldwide, less than half of what The Force Awakens managed domestically. Not to mention the inflated budget, with Ron Howard reshooting nearly the entire movie after Phil Lord and Chris Miller were fired. In any case, it may have been worth it just to bring Darth Maul back, if only for a brief moment. Be sure to check out the photos of Maul with his robot legs for yourself below. This news originated with Forbes.